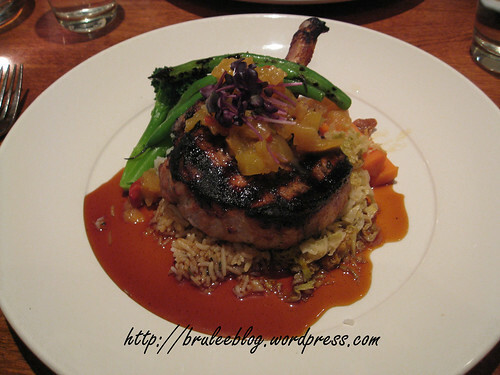 For the entrées, my dining companion chose the fish (seared Arctic char with ratatouille, roast garlic butter sauce and mashed potatoes), while I chose the meat (marinated pork rack chop with Moroccan BBQ sauce, tropical fruit chutney, savoy cabbage and herbed rice). The fish skin was nice and crispy and the fish cooked all the way through. The star of this dish was the accompanying sauce and ratatouille, which gave the fish and mashed potatoes a wonderful subtle flavour. Without the sauce, the mashed potatoes were too salty to eat on their own. The pork was barbequed all the way through with some nice grill marks. Like the fish, however, this dish also was not the same by itself and needed the sauce from the fruit chutney as well as the savoy cabbage. The sauce gave the meat a kind of sweet and sour flavour, and the cabbage had been made into a wonderfully tasting sauerkraut. There were two choices available for dessert, so we chose one each. My dining companion had the warm chocolate cake (individually baked warm chocolate cake served with vanilla bean ice cream), while I had the bread pudding (blueberry and white chocolate bread pudding served warm with crème anglaise). The dessert portions were perfectly sized to end a full meal, rather than having giant-sized desserts that people have to struggle with to finish. 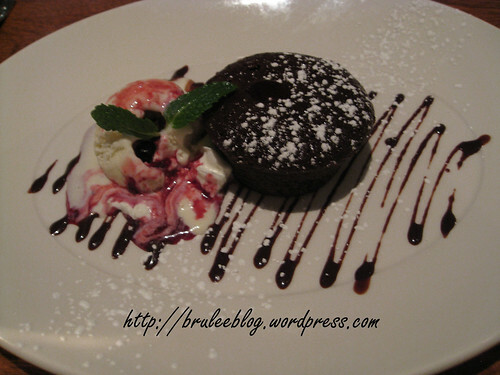 The chocolate cake was dense and strongly tasted of dark chocolate. It would satisfy any chocolate lover. 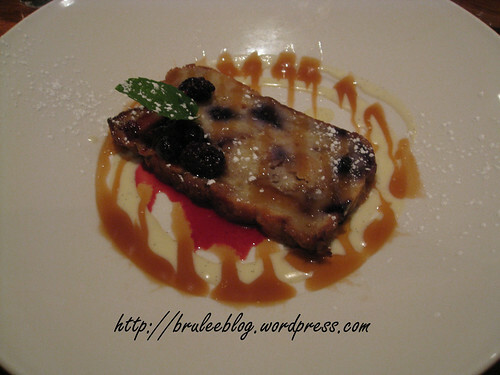 The bread pudding on the other hand… we both agreed that this was the best dish of the meal. Sliced very thinly from a loaf shape, the bread pudding was firm enough to cut and easily eat with a fork. Once it went into your mouth, it melted into a custard-y pudding bursting with berry flavours. I didn’t notice any white chocolate flavours, but I was too busy moaning with pleasure to care. Freaking fantastic. I may have to go back to the restaurant just to have this dessert again. Total for the meal came to $74 plus tax and tip ($35 each per person, plus $2 each for coffee/tea). I 100% agree on the bread pudding. 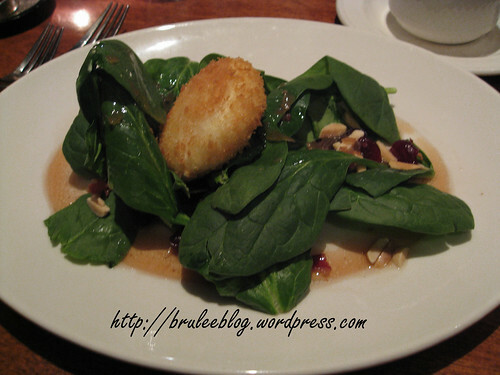 I had the chocolate cake but wished I had the bread pudding instead. 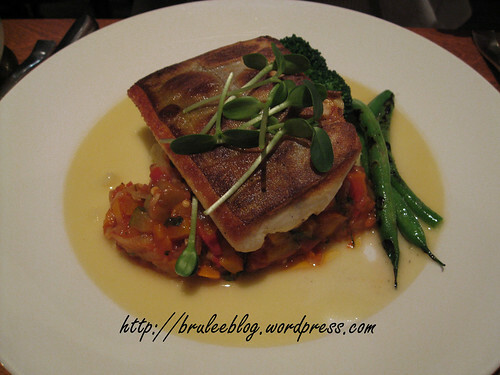 The night I went, they were out of arctic char, so they offered the herb crusted Alaskan cod which was lovely. It was my first visit to the Red Ox Inn and I am definitely going back! By the way, I had the mushroom soup and it was delicious (and I’m not much of a mushroom eater in the first place). Mmm the cod sounds yummy!